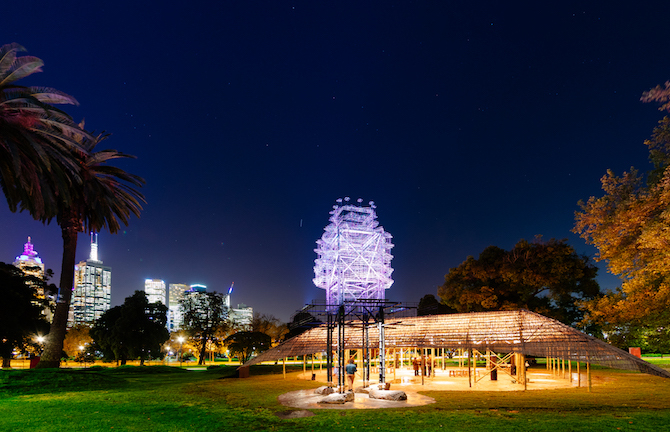 From Sunday 9 October, join us after sunset for MPavilion’s daily dalliance with twilight as we transition into night. Hear a composition by Melbourne artists Geoff Nees and J David Franzke in-synch with a light show from lighting designers bluebottle. This collaboration, featuring the masterful tabla playing of Aneesh Pradhan and an Indian-inspired ambient soundscape assembled by J.D Franzke and Geoff Nees, combined with bluebottle’s vibrant lighting design, is a beautiful sensory feast to propel us into the night.